It appears that these Blaseygate co-conspirators have even coordinated their revolutionary colors. Who in their right mind can argue with the above subtitle: “The Left has gone stark raving mad!”? Who said it? Just about every rational person watching the Kavanaugh confirmation circus. The Republican leaders have asked again to see the most important piece of evidence — the original unredacted letter submitted by accuser Christine Blasey Ford — that unexpectedly triggered the postponement of the confirmation vote for SCOTUS nominee Brett Kavanaugh. The Democrat ranking member — Sen Diane Feinstein — has steadfastly refused to hand it over to her peers or the GOP leadership. Not only that, but Feinstein et al. are calling for a new FBI investigation into the matter which the FBI has refused to conduct—there’s nothing for them to investigate. It’s a 36 year-old case that was never reported in the first place, and Ford herself refuses to testify. All the while, the growing phalanx of female social justice warrior attorneys surrounding the accuser is making more demands by the day. One would think that these lawyerly feministas are running the Senate Judiciary Committee, so brazen and unprecedented are their unreasonable requests. KEY POINT: Christine Blasey Ford and her feminazi lawyers who have carried out this charade have profoundly disrespected the Senate and the SCOTUS justice confirmation process. They have made frivolous demands and requested relentless accommodation by the Judiciary Committee regarding her promised testimony that everyone knows are nothing but stalling tactics. Would the Republican majority still cut her so much slack after seeing the photos in Blasey Ford’s high school yearbook? Here’s the link that provides the back story to what really went on in the accuser’s high school. The exposé also contains many other telling photos of Christine Blasey’s high school environment which ought to be seen by everyone. There really is something very wrong with these people! A quick scan of today’s headlines clearly shows that the Democratic Party is so out of control it’s scary. Their sheer desperation to thwart the confirmation of Brett Kavanaugh is unlike anything the country has witnessed before. The only conclusion that one can come to is that they have lost their God-given capacity to apply human reason or to utilize common sense. Hence, this obstreperous tribe of political bolsheviks can no longer be allowed to exercise political power in these United States of America. The most corrupt and criminal need to be removed from their key posts within the U.S. Federal Government before they do something really dangerous if not cataclysmic. KEY POINT: These agents of Deep State have already launched a full-blown soft coup against President Trump with daily black ops and psyops. They have been unrelenting in their brazen attempts to delegitmize the POTUS with every news cycle. The real concern now is that the bolsheviks will conduct a violent coup d’état as a result of so many failed initiative to topple Trump. The entire Democratic Party has been taken over by extreme left-wing radicals, ultra-liberals, hyper-progressives, socialist demagogues, communist provocateurs and balaclava-covered bolsheviks who bear no resemblance to the party of John F. Kennedy. If there is one ultra-liberal persona who has come to represent everything that is wrong with the Democratic party it is Christine Blasey Ford. Her fastidiously planned charade was carried out as a psyop to disrupt and alter the outcome of what was shaping up to be a slam dunk confirm for Brett Kavanaugh. Ford’s every move has exposed her as either a complete fool and/or an unwitting dupe who tried to fool the American people, as well as a tool of Deep State who has ruined her reputation forever. There’s no question that Christine Blasey Ford now has a very serious problem. Once she consented to being the public face of this extremely dangerous conspiracy, she, herself, put a target on her forehead. The Right is justifiably furious with her transparent deception and there are lone rangers everywhere who may act out that anger. The Left, on the other hand, will not be happy until there’s blood — LOTs of it — and Ford is the only ultra-liberal hitwoman involved who can draw that blood. Hence, her Deep State handlers have put her future and her life is in very serious danger. There’s even a strong case why the rogue CIA would want to suicide her. See: Will the C.I.A. suicide the Kavanaugh accuser? 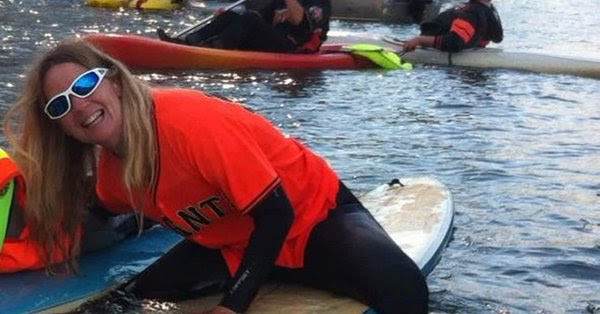 Perhaps Blasey Ford ought to stay away from water sports for the time being, the CIA loves doing drownings. There is a very telling exposé which may have the clues as to what really went on here. The underlying theory is that the Left is extremely consistent in projecting their own sins onto their enemies. They have followed this sociopathic pattern with extraordinary reliability over decades. You pick the scandal that the Democrats have fabricated in Congress and you can be sure they are really the guilty party. They know the best defense is an aggressive offense as the whole nation has witnessed with the utterly fake “Trump-Russia collusion” scandal. The real scandal is not only that the DEMs invented it from thin air, they are guilty of collusion with criminal elements in Russia, not the Kremlin. 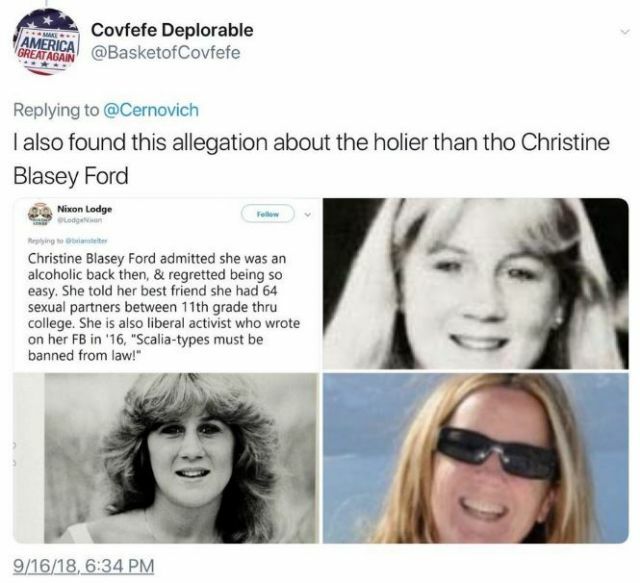 Now it appears that Blasey Ford has perpetrated the very same type of despicable hoax with the likes of Feinstein et al. Perhaps the most damning aspect of this self-made scandal for Blasey Ford is her proven connections to the abortion pill. This piece of the puzzle may very well reveal the whole megillah because of the massive revenue streams that would be put into jeopardy were Roe v. Wade to be overturned by a Supreme Court with a new pro-life judge—Brett Kavanaugh. This radioactive exposé lays it all out: Christine Blasey Tied To Abortion Pill, Big Parma Profits Threatened by Kavanaugh. My Mom a life-long 88 year old Democrat said tonight she is changing her party to Republican. She said she is thoroughly disgusted with the Democrats and is sickened by what they have become. She said the Democrat Party is going to be losing many many votes over this. My Mom is very smart and sharp as a wit. 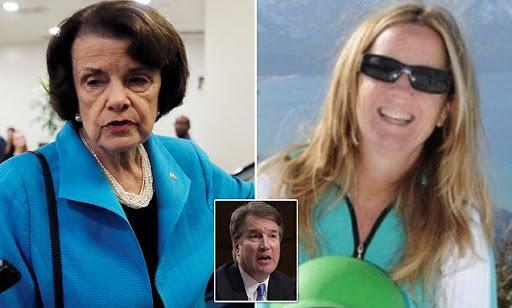 Its over, Democrats, all of Ford’s corroborating witnesses have no recollection of this [party]. There is also a HUGE unintended consequence to the Deep State Democrats. They have unwittingly neutralized the most powerful weapon in their political arsenal. They have turned US all into “Bret Kavanaugh”. This unparalleled debacle has shown — in glowing color during prime time — the perilous risk that every man in America now faces. As a result, Patriots and Nationalists, Conservatives and Christians, Tea Partiers and Libertarians, Independents and Republicans have coalesced around eliminating this Soros-funded existential threat. In so doing, they have collectively decided that they won’t take it anymore. We are all Brett Kavanaugh! The older sister of the author is an ultra-liberal leader of her extremely fervent LGBTQ community. She grew up as the most heterosexual (and sexually active) girl in her high school. Then, one day she became a lesbian. From that day forward, she methodically re-wrote her personal narrative so that she no longer remembers her heterosexual past. She now says that she was always a homosexual which is demonstrably false, and the entire family knows it. This highly self-deceptive type of behavior is all too common in the LGBTQ community. Over the past few years the same older sister has made many public statements on Facebook whereby she claims to have been the victim of all sorts of rapes. I only remember one instance where she claimed to have felt threatened by the father of a high school friend, but was never touched. This single incident eventually gave way to her being a victim of a literal crime wave of rapes and attempted rapes. This is what happens to many of these hyper-progressive Social Justice Warriors when they smell blood in the water. The funny thing is that it always ends up being their own blood in the end. The crucial point of this personal sharing is that it reflects the strong tendency of the Left to revise history wherever it suits their LGBTQ agenda. Then they repeat the factually false account so often that they start believing it. Then they convince others of the same ilk to believe it whereupon it politically metastasizes and creates a fiasco like Blaseygate.